Designed to inspire and with more than three decades of experience, the Charvel® Pro-Mod So-Cal Style 1 HH FR E is a slick performer with premium features and versatile sound every guitarist will appreciate. 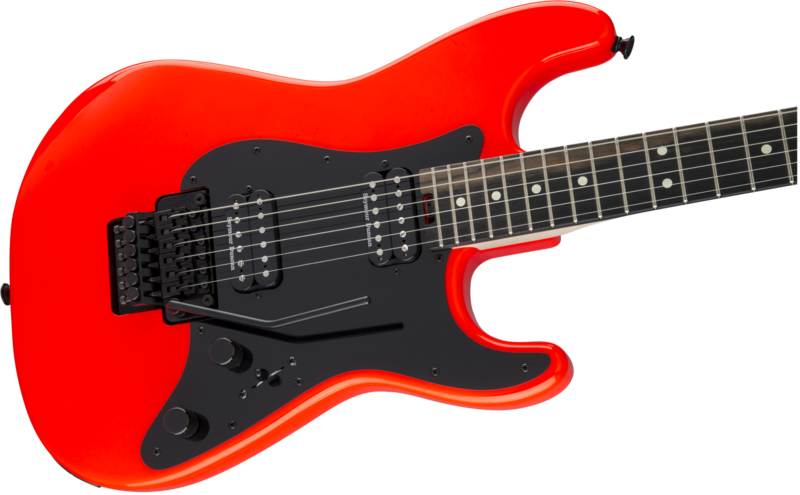 Born from a love of high-speed playing and smooth style, this fun-in-the-sun guitar is packed with the classic playability and innovative design elements that have made Charvel a legendary name in high-performance axes. More comfortable than an overstuffed armchair, the So-Cal body is sleekly sculpted out of alder and paired with a rock-solid bolt-on maple neck with a pair of graphite reinforcement rods to handle the ravages of the road and climate. A conveniently located heel-mount spoke wheel allows for rapid truss rod tweaks, even in between songs. Engineered for effortlessly nimble playing, the speed neck profile and 12”-16” compound radius ebony fingerboard are perfect for all styles of play — from low end riffing to soaring leads with worry-free upper-register bends. Hot-rodded for unparalleled performance and versatile sound, this instrument hosts a high-output Seymour Duncan® TB-6 Distortion humbucking bridge pickup and a warm, fat Seymour Duncan® SH-6N Distortion humbucking neck pickup for killer tone. The volume control hides a push/pull coil split for even more highly useful tonal variations, ideal for everything from a biting lead sound to thick, chunky rhythm work. The no-load tone control operates like a standard tone control from positions one through nine, removing itself from the circuit at position ten for transparent sound, letting the full natural voice of the guitar shine through. Scream or rumble with the Floyd Rose® double-locking tremolo system without sacrificing tuning stability or the pinpoint intonation.